Anyone who spends time traveling in an RV knows how important it is to have good cell phone reception. The problem is you never know when and where you might lose the signal while driving down the road. 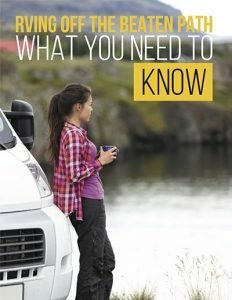 Wise RVers know you have to prepare to stay connected. Why does cell phone coverage drop in some areas? The answer is one of two things. The first reason is your location. 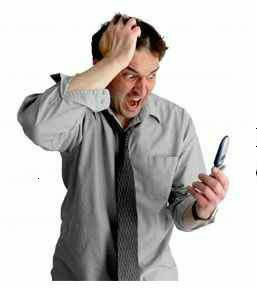 If you are too far from a cell tower the signal breaks up before reaching your phone. The second reason may be that something is blocking or obstructing your signal – this could be mountains or trees. It could also be your RV! 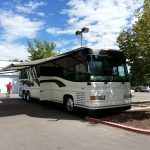 Most RVs are made of materials that block phone signals. So the question now becomes, how do you boost your cell phone reception while in your RV? The answer is simple — it’s called a cell phone signal booster! A signal booster improves the reception inside your RV by boosting and amplifying the signal. Cell boosters contain three main parts: the External antenna, the amplifier and the internal antenna. When these parts are combined they work together to boost your cell coverage and help you hear the phone! A cell phone signal booster will also increase your ability to use your data plan for internet access or other information based processes. What Type of Cell Phone Booster is Right For You? There are a number of different options when it comes to cell phone boosters. The easiest cell phone signal booster is called a cradle. The cradle allows one phone to sit in the booster all the time and catch the increased signal. The signal is boosted from a magnetic mounted antenna that you stick on top or outside your rig. For one person, the cell cradle works well and can be used in either the RV or the car since it is small and portable. 4G Boosters and LTE Boosters are the most recent options. Nearly all cell phone carriers now provide a 4G network and most are moving to the faster LTE option. A signal booster of this type is a permanent addition to your rig and may or may not require relay units depending on the length of your recreational vehicle. 3G Booster Kits are for older phones or smaller 3G networks. In most cases this type of phone is out of date. This booster kit is mounted permanently into the RV and provides amplification for the entire rig. It is especially effective in smaller RV’s. 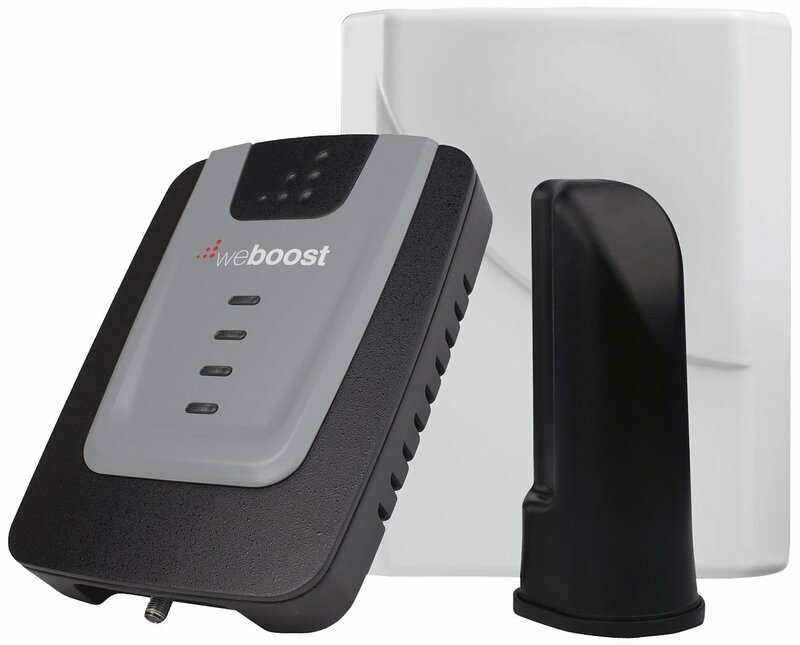 Some of the most popular signal boosters are made by weBoost (formerly called Wilson electronics) and SureCall. Both brands offer a variety of units through Amazon.com and UberSignal.com. 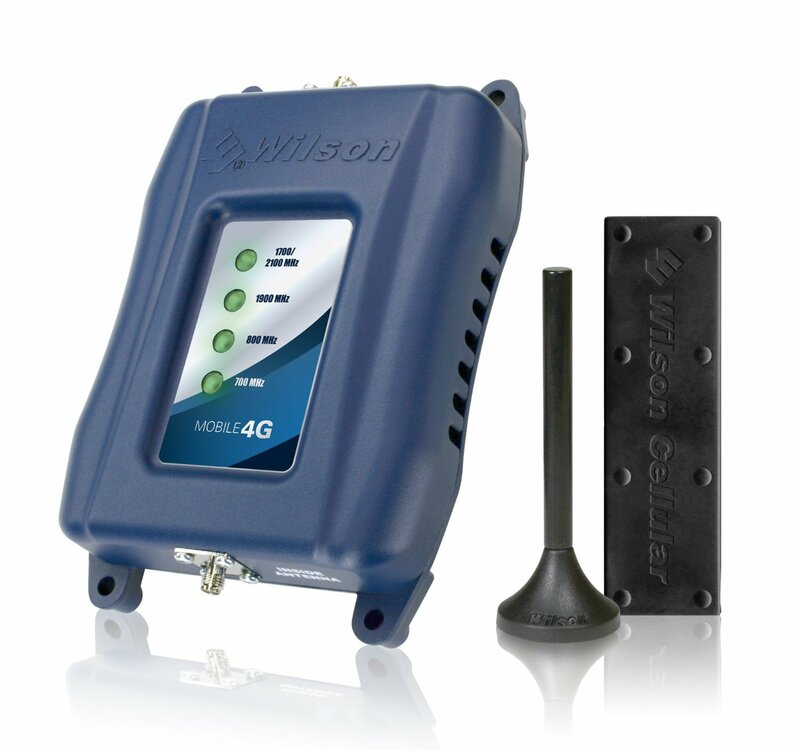 The most popular unit is the weBoost 4G Cell Boost Kit. 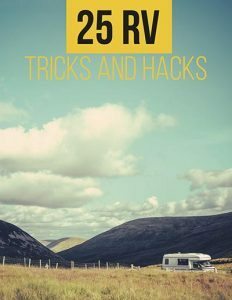 This kit works great in all size RVs, and provides an increased signal strength without having the phone connected to the unit itself. It strengthens the signals both to and from the cell tower, and works for both 3G and 4G signals. It will handle up to 4 individual cell phone signals, so the entire family can use it on the road. My husband and I own a Wilson 4G signal booster. This is the older version of the recently re-named weBoost mentioned above. We live in a large metal Class A (much like a bus), and RV phone reception can be sketchy at times. We experience occasional issues with the RV obstructing our cell signal. By adding a cell booster we are able to work from our rig using the data from our phone. I can assure you that it weren’t for the booster, we’d be in trouble. The truth is, regardless of what mobile company you use, you will probably need a cell booster if you plan to live and work from your RV. How to Install a Cell Phone Booster? 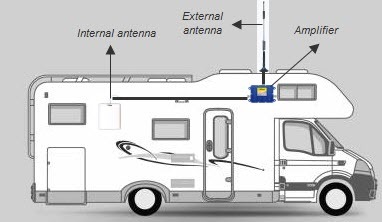 If you choose a permanent signal booster you will need to mount an external antenna outside your RV. They can be mounted to a pole, a ladder, glued to the roof or installed with a hole via a professional installer. Once the external antenna is mounted a cable is run through the RV to the amplifier unit. A cable from the amplifier connects to a second interior antenna mounted to the back of the RV. Once the two are connected you should see a significant increase in your signal strength. One unit doesn’t fit all. The size of your rig, the phone company, the type of material your RV is made of, and the anticipated signal weakness all play into your decision. That’s why it’s important to read reviews and carefully consider all the options. Several companies also offer professional booster installation if you prefer not to set it up yourself. For more information on all things related to mobile Internet, be sure to check out the site RV Mobile Internet.com. Here you will find the latest information on new boosters, improved data plans, signal coverage options, and much more. One article that is a must read for anyone considering a cell booster is The Definitive Guide to Cellular Booster Registration. Here you will learn all about the new FCC requirement for registering cell signal boosters. What are you waiting for? You don’t have to live with bad phone reception. Mobile phone companies are increasing their reach every day. Combine this with a simple cell booster and you will improve your data and your reception. Any other suggestions? How have you increased your cell phone coverage in your RV? Have you found certain booster units are better than others? Add your thoughts in the comments below. Thanks for reading this and please share it, like it or tweet it to your friends!